Tucson, San Xavier, Amado, Nogales, Patagonia, Saguaro, and more! 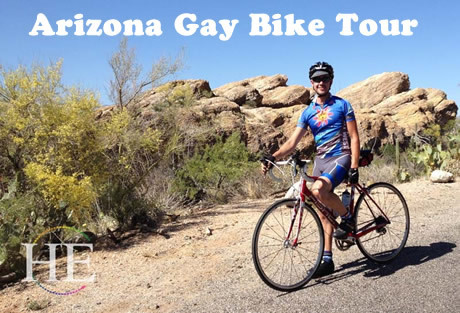 Cycle miles of pristine bike trails on this gay Arizona bicycling adventure. Enjoy city life in Tucson then ride south to see historic landmarks, rugged canyons, and blazing sunsets. Cross the border for a Mexican feast, and soak up the colorful character of the American Southwest. Starting in Tucson, we'll tour the city to get a bit of local color while getting used to our bikes, and then enjoy a welcome dinner. The next day we'll make our way south through historic and Mexican-flavored neighborhoods before entering the San Xavier Indian Reservation. We'll stop at the magnificent Mission San Xavier del Bac, founded in 1700 by Father Kino. From the mission we'll pedal through the Indian village of Bac, with its picturesque graveyard, and then plunge into the stark and sometimes startling landscape of the Sonoran desert on quiet Mission Road. Our route follows the beautiful Santa Cruz River, a linear oasis in the desert. From the artists' village of Tubac (Arizona's oldest town) to the Tumacacori National Historic Park, there is plenty to see. We'll learn of the cultural clashes between Spanish settlers and local Apaches, and see the beautiful remnants of the old, failed mission. Continuing southward we head to the border town of Nogales with its laid-back atmosphere and plenty of sights and shopping, and we'll walk across the border for dinner. We'll return to Tucson via an alternate route which will include a ride through Saguaro National Park. From the lush green grasslands to the sea of sand and desert, from cosmopolitan Tucson to honky-tonk Nogales, our Cycling Arizona tour offers plenty of variety, great rides and a chance to experience the Southwest like no other tour. 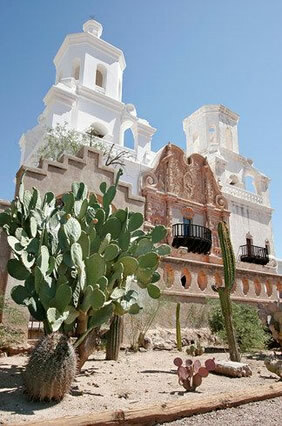 • Tour Tucson, famous for its bi-cultural heritage. 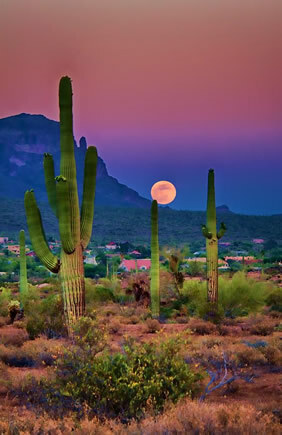 • Ride through the rough beauty of Saguaro National Park. • Visit Indian villages and art colonies along our route. • Cross the border for dinner in Nogales, Mexico. • Enjoy REAL Southwest cuisine and relax with an ice cold cerveza after a long ride. 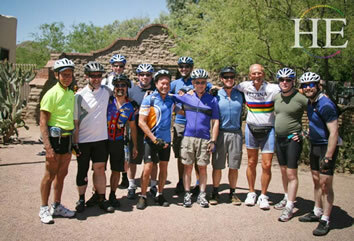 • Experience the desert while riding with a great group of new friends. 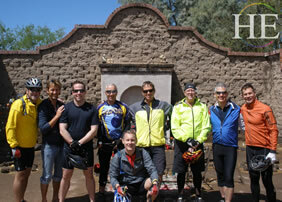 • Join our guides for an extra day of hiking and biking from Tucson following our official tour. Let us know if you're interested. Tucson is a happening town. It's historic; it's hip; it has great restaurants and fun nightlife. We'll start with a bike tour of the town, to get acclimated to our bikes, the dry air, and the laconic pace of the desert Southwest. There are plenty of great places to ride in and around Tucson. National and State Parks surround the city with cactus forests, rolling hills, and craggy mountains. There are also a lot of cool and funky ethnic neighborhoods, offering interesting views into city life. After breakfast, we ride south to the San Xavier Indian Reservation, where we'll do the bulk of our riding today. First stop is the magnificent Mission San Xavier del Bac, founded in 1700 by Father Kino, where we visit the interesting museum, and the mission itself. From the mission we'll pedal through the Indian village of Bac, with its picturesque graveyard (off-limits, alas) and then plunge into the bizarre landscape of the Sonoran desert on lonely Mission Road. After passing some enormous copper mines, our route slopes down to Green Valley, a town of retirees with wide bike lanes that also accommodate golf carts. Perhaps Green Valley's most interesting attraction is the Titan Missile Museum, where you can see the only remaining missile of its kind – a full ten stories tall – and get a guided tour of the launching facility. 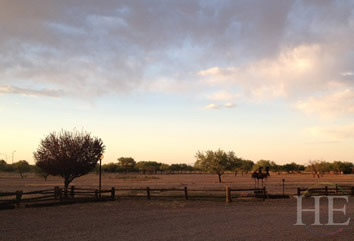 We'll spend two nights in the sleepy cowboy village of Amado, but there will be plenty of things to keep us moving. The next day offers several options, depending on the group. There's great hiking in the nearby Santa Rita Mountains (which top off at well over 9000 feet); mountain biking on the famous Elephant Head trail, or up to the top of Mt. 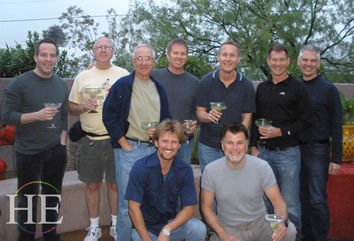 Hopkins with a visit to its observatory; horseback riding in nearby Rio Rico; or just hanging out by the pool, getting spa treatments, and attending a yoga class right on the premises. Hard-core cyclists will love the quiet, undulating road to hippyesque Arivaca and the tiny border town of Sasabe (the whole trip makes a perfect century). And you can even learn to cook for your dog at Dog Chefs of America, just down the road. Dinner tonight is on your own, with an intriguing possibility at the nearby Longhorn Grill. There's a lot to see today on the road to Nogales. Our route follows the beautiful Santa Cruz River, a linear oasis in the desert. From the artists' village of Tubac (Arizona's oldest town) you can walk along the river in the shade of cottonwoods and sycamores until our next stop: Tumacacori National Historic Park. Here you'll learn of the culture clashes between Spanish settlers and local Apaches, and see the beautiful remnants of the old, failed mission. Continuing southward toward the border, you'll have the opportunity to make a scenic side trip to Pena Blanca Lake. Nogales is probably the most appealing town along the US-Mexican border, with a laid-back atmosphere and plenty of sights and shopping. We'll stay on the American side of the border but have plenty of time to explore the shops along Avenida Obregon before dinner at an old mansion on the Mexican side, complete with margaritas and mariachis. At only 33 miles, today is a shorter day of riding (though extra miles are always an option), taking us through beautiful forests up to the only grassland area in Arizona. Along the way, we can stop at Patagonia Lake State Park and rent a rowboat, take a bird-watching hike along Patagonia Creek (owned by the Nature Conservancy), and stop for lunch in the charming, increasingly chic old village of Patagonia. 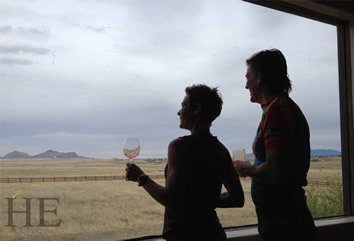 Sonoita, tonight's destination, is also the center for Arizona's budding wine industry, boasting numerous good restaurants. This will be our home for the next two nights. Today we offer an easy 20-mile loop through southern Arizona's wine country or a more strenuous 60-mile round trip to Parker Canyon Lake through scenic high desert forests of pine and oak. From Sonoita it's mostly downhill back to Tucson (roughly 50 miles), on fantastically scenic Highway 83. Our ride includes an 8-mile cycling loop on Cactus Forest Drive through Saguaro National Park and a picnic lunch. From here it's an easy ride back into town, with bike lanes the whole way. Now that we've seen a big chunk of Arizona, a farewell feast will top off the day. • Map and route instructions. • Beverages not included with meals. This tour starts and ends in Tucson, Arizona. Our typical cycling day is 35-55 miles on rolling terrain with some hills.